So, I checked the Goodreads rating details for Morning Star, and apparently, I’m the 1% that didn’t like this book (more specifically, the 1% that gave this book a 2-star rating). You can imagine why I have to force myself to write a review for this. Okay, this has to be just me. Everyone seems to love this series but for some reason, I just don’t see it? I really didn’t want to hate this book, but honestly, I can say a little bit that I somewhat expect this from the events of Golden Son. I don’t know. I guess when all your favorite characters all head downhill then this is literally what you’re supposed to expect. escapes torture from the Jackal (after the events of Golden Son) he immediately goes on to continue his mission. Basically, I already spoiled myself for this book, because, duh! Darrow always wins! and that didn’t even work out half the time, so . . . Honestly, if you love the Red Rising series, great for you! I can definitely see what people would love about this! And if you read my review to Golden Son, then I mentioned that I was in the mood for the political tension that was happening throughout the book. I just wish that I enjoyed this series as much as everyone else did. I don’t know, I’ll just say that this series wasn’t for me. 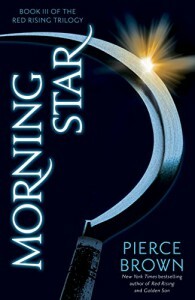 Apparently, Pierce Brown is writing a sequel trilogy to this, which revolves around the consequences and the aftermath of Morning Star, but I’m not really interested.